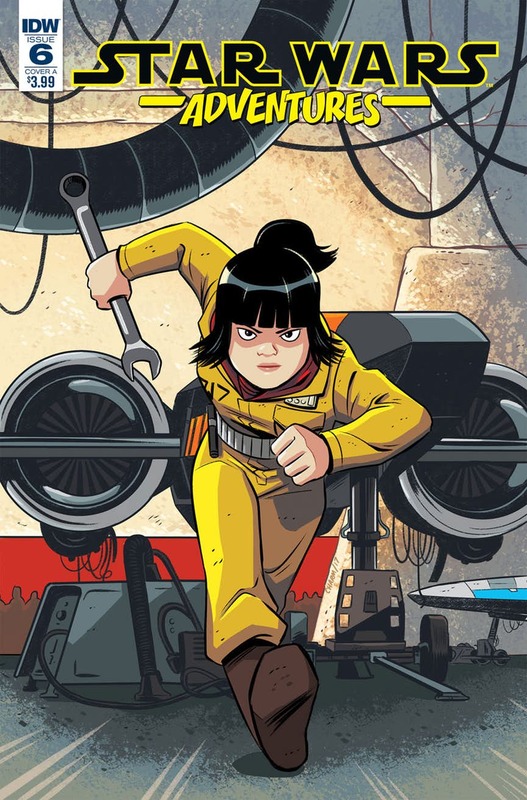 Star Wars #6 kicks off with “Rose Knows” by Delilah S. Dawson. Unfortunately, Rose doesn’t know, at least not at the beginning. Poe gets trapped outside withe a bunch of First Order Tie Fighters and it’s up to Rose to unlock the hangar doors so reinforcements can help him. Everyone teases Rose about reading, and in the end, it’s up to her reading of the manual to fix the problem. It’s kind of a kiddie story, but there’s a few good moments here and there. With Rose saving the day, everyone gets to know Rose, which kind of helps explain why people like Poe would have been willing to trust her in The Last Jedi. From there, the issue heads into “Podracer’s Rescue.” This leads to a prequel flashback that shows a young Anakin on Tatooine in Watto’s shop. He comes across a part he could use for his podracer, but ends up using it to help out a hospital instead. The moral of the story – if you can help someone out, you should. It’s an okay story. But then again, I’m an adult, and this is an issue targeted for kids, so it’s not too surprising that I might find these stories a little lacking from time to time. The artwork is bright and colorful, but adults might be a little wanting with the stories in this issue. The kids, however, might enjoy them. All in all, this one was okay, so I give it three out of five nexus.